Granadilla is a shared common name for three varieties of Passiflora: Passiflora quadrangularis, Passiflora incarnata, and Passiflora edulis. CHINESE: Xi fan lian, Xi guo fan lian, Yan shi liu, Ji dan duo. DUTCH: Eetbare passiebloem, Paarse-passievrucht, Passiebloem, Passievrucht, Passie vrucht. ENGLISH: Couzou (Guyana, Surinam), Passion fruit. FRENCH: Couzou, Fruit de la passion, Grenadille pourpre, Maracaju pourpre, Passiflore comestible. GERMAN: Granadilla, Passionsfrucht, Purpurgranadilla, Purpur-Granadille. 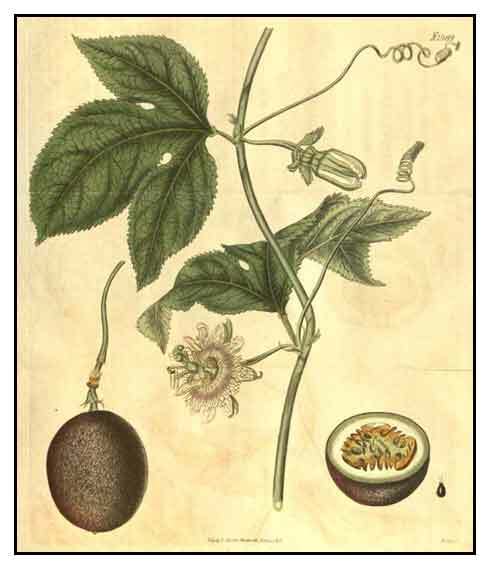 ITALIAN: Granadiglia, Frutto della passione, Passiflora commestibile. MALAY: Buah susu, Konyal (orange-skinned), Markisa (purple-skinned). PORTUGUESE: Flor-da-paixão, Granadilho, Maracuj (Brazil), Maracujá, Maracujá-mirim, Maracujá-peroba, Maracujá-pequeno, Maracujá-roxo, Maracujá-suspiro. SPANISH: Ceibey (Cuba), Couzou (West Indies), Curuba (Colombia), Fruta de la pasión, Maracuja Parcha (Puerto Rico, Venezuela), Parchita (Venezuela), Parchita maracuyá. THAI: Lin mang kon, Ling mang kon, Saowarot. - Passiflora edulis belongs to the Passifloraceae family, with about 500 species distributed in warm temperatures and tropical regions. - Granadilla is a shared common name for three varieties of Passiflora: Passiflora quadrangularis, Passiflora incarnata, and Passiflora edulis. - The "passion" plant name derives from the early Spanish times when the floral parts symbolized aspects of the Crucifixion: the five stamens signifying the wounds; the petals and sepals, the apostles; the corona inside the petals, the crown of thorns; and the three pistil stiles, the nails of the cross. Pasyonaryo is a sturdy climbing vine with angular stems. Leaves are ovate, deeply 3-lobed, green, with many serrate edges, up to 13 centimeters broad. Fruits are edible, globular-oblong, dull purplish, with a hard rind, up to 6 centimeters in diameter. - In the Philippines, cultivated in gardens in towns and cities. - Studies have shown antibacterial, anxiolytic, anti-inflammatory and lipid-benefit activities. - Studies have suggested antioxidant, anti-inflammatory, antiproliferative, anxiolytic, hypnotic, antibacterial, analgesic, anticonvulsant, anti-sickling, antihypertensive properties. - In Brazil, the fruit is widely cultivated and used in the food industry as processed juices. - No reported medicinal use in the Philippines. - Elsewhere, used for hypertension. - Rituals: Juice reportedly used in Brazilian jurema rituals. Sorting Passiflora names / Maintained by: Michel H. Porcher / MULTILINGUAL MULTISCRIPT PLANT NAME DATABASE / A Work in Progress. School of Agriculture and Food Systems. Faculty of Land & Food Resources. The University of Melbourne. Australia / Copyright © 1997 - 2000 The University of Melbourne. Comparative studies on anxiolytic activities and flavonoid compositions of Passiflora edulis 'edulis' and Passiflora edulis 'flavicarpa'. / Li H, Zhou P, Yang Q, Shen Y, Deng J, Li L, Zhao D. / J Ethnopharmacol. 2011 Feb 16;133(3):1085-90. doi: 10.1016/j.jep.2010.11.039. Epub 2010 Nov 24. 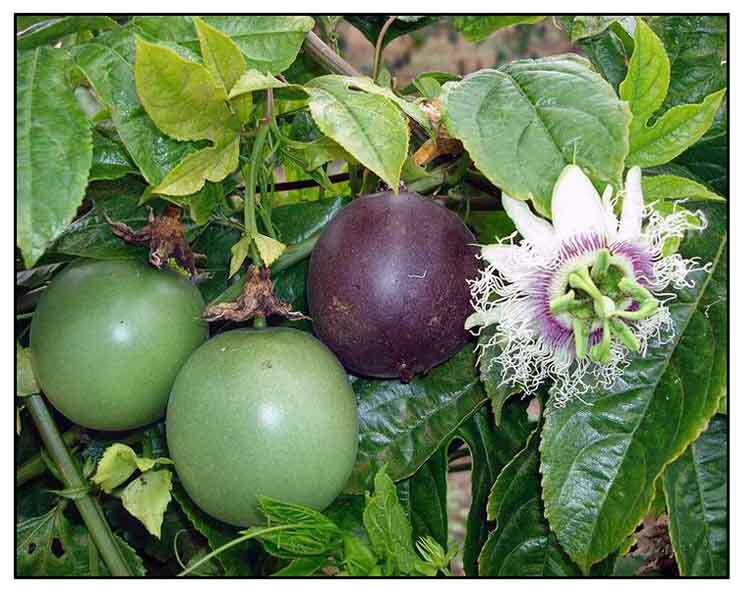 Comparative pharmacological study of hydroethanol extracts of Passiflora alata and Passiflora edulis leaves / Petry RD, Reginatto F, de-Paris F, Gosmann G, Salgueiro JB, Quevedo J, Kapczinski F, Ortega GG, Schenkel EP. / Phytother Res. 2001 Mar;15(2):162-4. Preliminary Phytochemical and Anti-Bacterial Studies on Passiflora edulis / Johnson, M*, Maridass, M and Irudayaraj V / Ethnobotanical Leaflets 12: 425-432. 2008. The aqueous extracts of Passiflora alata and Passiflora edulis reduce anxiety-related behaviors without affecting memory process in rats. / Barbosa PR1, Valvassori SS, Bordignon CL Jr, Kappel VD, Martins MR, Gavioli EC, Quevedo J, Reginatto FH. / J Med Food. 2008 Jun;11(2):282-8. doi: 10.1089/jmf.2007.722. Antihypertensive effect and lethal dose 50 of Passiflora edulis leaves (maracuya) fruit juice and ethanolic extract in rats / ROJAS, Juan et al. / An. Fac. med. [online]. 2006, vol.67, n.3, pp. 206-213. Neuropharmacological activity of the pericarp of Passiflora edulis flavicarpa degener: putative involvement of C-glycosylflavonoids. / Ligia Moreiras Sena, Silvana Maria Zucolotto, Flávio Henrique Reginatto, Eloir Paulo Schenkel, Thereza Christina Monteiro De Lima / Exp. Biol. Med. (Maywood), 2009 Aug 2;234(8):967-75.